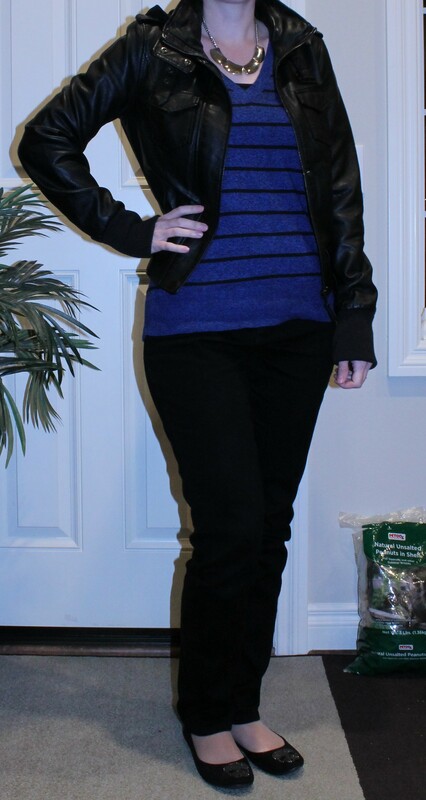 Looking back, I see that I wore a lot of black and Cobalt blue. I’ve definitely made the transition to dark winter colors without even realizing it. Here’s what I’ve been wearing. I got inspiration for the red jeans outfit from pinterest. I wouldn’t have thought to pair stripes with leopard print, but it works! I got this dress from Kohls on Black Friday. It’s a nice soft knit and warm for the office. 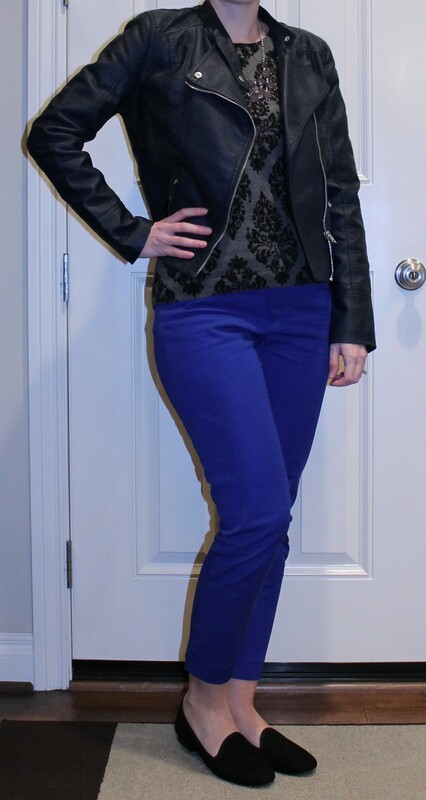 These are my cobalt pixie pants from Old Navy and my beloved bomber jacket from Golden Tote. Here I paired my Boden British Tweed Mini with a sweater I got from Target (also on Black Friday) and my Loft booties. 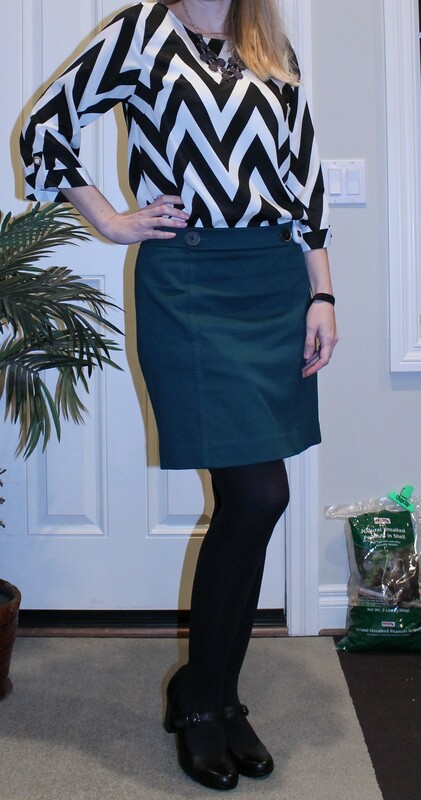 The skirt is from a few years ago from Loft, and the blouse is from ModCloth or Piperlime, I can’t remember which. Drapey Cardigan from Golden Tote surprise item. Knit Dress from Golden Tote as a surprise item. And again, my bomber jacket from Golden Tote which I love wearing. The sweater is from Target. Shorts. I think they have been the single most difficult thing for me to find for my body. If they are roomy enough in the rear and thighs, then they gape so much at the waist that you could fit another entire person in there. I’m not sure what it is about shorts, or why they seem to be made so different from pants, but this has been my experience consistently across almost every brand I have tried. 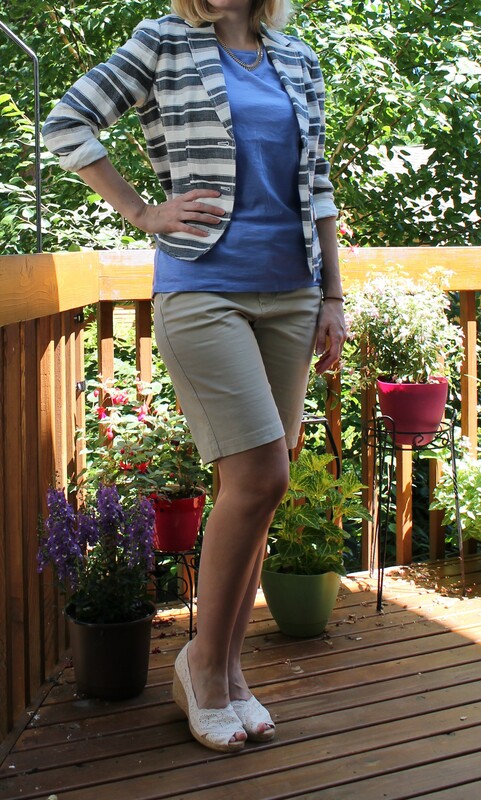 Most summers I just try to avoid them by wearing skirts and sometimes capris (which are almost as difficult to find), but this summer I decided I was going to search until I found something that worked without needing a ton of homemade alterations. What I found is that shorts with a partial elastic waist band, or a “tummy control” feature, tended to nip in more at the waist and were more likely to fit the way I needed them to. Some of the brands advertised things like “slightly curvy” which I found to be not at all and not even close to working. Unfortunately, it seems that you must shop for shorts sometime in the month of June, because when I looked in May the inventory was not there yet, and now in July it’s almost non-existent. Next year I’ll have to target June as the month to shop for shorts if I want a decent color in my size. How to put together an outfit with shorts.